Preface. IVF: The first four decades. Evaluation and preparation of the infertile couple for In Vitro Fertilization. Carrier screening. Testing ovarian reserve. Basics of ovarian stimulation. Role of antagonists in human IVF: The tool to a safer and more patient friendly IVF. Ultrasonography in IVF. Oocyte retrieval. In Vitro Maturation for clinical use. Sperm preparation for IVF and ICSI. Assisted fertilization. Analysis of fertilization. Human embryo development and assessment of viability. Embryo culture systems. Polar Body, cleavage stage and trophectoderm biopsy. Preimplantation genetic testing. Oocytes and embryo cryopreservation. Quality control and quality assurance in the IVF Laboratory. Oocyte donation. Endometrial receptivity. Embryo transfer. Multiple vs singleton births: Consequences and prevention. Monitoring and evaluation of infertility treatments: Is there a priority for monitoring of cognitive function in children born from ART and other treatments? David K Gardner, D.Phil., is Professor in the School of BioSciences, University of Melbourne, Parkville, Victoria, Australia. Carlos Simón, M.D., Ph.D., Professor of Obstetrics and Gynecology, Universidad de Valencia, Instituto Universitario IVI/INCLIVA, Valencia, Spain; is Scientific Director, Igenomix S.L. ; and Clinical Professor, Department of Obstetrics and Gynecology, School of Medicine, Stanford University, Stanford, C.A., U.S.A. This is probably the best of the books I was sent to review for 2018. I really enjoyed the well written first chapter with an important history of IVF, in real danger of being lost or forgotten in the market driven world of IVF in 2018. 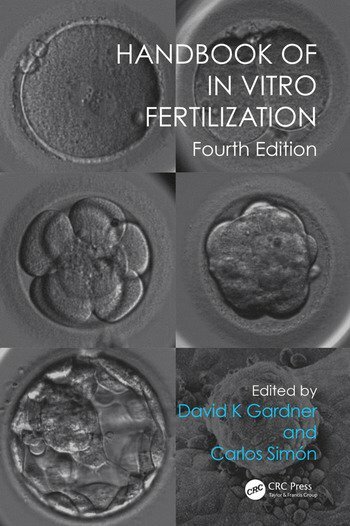 The detailed content of the chapters is very helpful, well referenced and terribly useful as an update to date reference book for all aspects of IVF. This feels like a very responsible book aiming at the majority of clinical teams working in assisted conception. It's text is well delivered and scripted to ensure it is readable and accessible. This should be on every clinic's shelves for ease of access to this material. This is an excellent book - good perspectives and well written - covering an useful range of clinical and research areas. I really enjoyed this.